The following article was contributed by FightLikeAChampion.com / Jaime Lapena Jr – dedicated to undertstanding the competitive forces behind mind, body and spirit that drive some people to win and others to be great. We encourage you to check out more at their website, we enjoy their interviews. Olympic teams over the course of an amazing 60 year career. 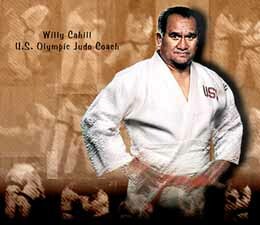 Willy Cahill has coached nearly 1000 National and International medal winners. served eight years in the Marine Corp.
now and what’re your feelings on it? Davina and Charlee Minkin with coaches Jim Powers and Willy Cahill. The Minkin sisters won the Triple Crown in 1996 and won Gold Medals at the US High School Nationals in 1997. Charlee represented the United States at the Junior World Championships in Portugal in 1996 at age 14.
blend strikes with standing throws and lockups. brothers, and some of the Gracie’s come by. respect those guys a lot because they put it out there and compete. came, I told them to just put the gi’s on. normally use at the bigger tournaments. John Matsuoka won a bronze medal at the World University Games in Belgium in 1990.
thing up there when I visited was to mentally get me ready. think the whole thing is that they’ve got to enjoy what they’re doing. United States Championships three times. Then he went to high school and started wrestling. In the last two years, he didn’t do any judo. second in the United States Nationals. before and the guy just barely beat him. step out there and perform. with athletes during the competition? Pierre Sene, Pat Barre, and Laurie Mintz all placed in the US Judo Senior Nationals held in Florida recently. Pierre won first place, Pat third and Laurie another first. one thing I see is when someone loses his / her concentration or focus. Some people get behind and that’s it. They break. stopped on the mat, they mentally break. block in the way, there’s not that ability to adapt to the situation. do you get them around that obstacle? coach the physically gifted or high level. everyone to enjoy the benefits of the sport. Brett Barron won the gold medal at the Pan American Games in Caracas, Venezuela. One year later, Brett represented the United States at the Olympic Games in Los Angeles. athletes to fine tune themselves? as a training ground trying out new moves. you’re confident enough to make them work. You’ve also got to spend time overseas. If you’re expecting to be a top athlete, it’s a must. FightLikeAChampion: Do you have any favorite products? this really helped my legs.